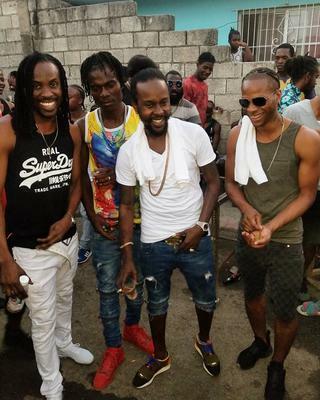 Dancehall entertainer Popcaan recently passed thru the community of Seaview Gardens in Kingston, Jamaica, and it was pure fun. A recent photo surfaced online with Reggae artists Nesbeth, Blakkman, Popcaan and Dexta Daps. The photo was first posted to Dexta Daps Instagram page with the following caption "Respek fi bring a joy 2 my City...A day my ppl will always rem.."
Dexta Daps and Blakkman are from the community of Seaview Gardens. Popcaan in an interview recently said the artists in Dancehall and Reggae music industry needs to unite for the good of the genres.